This weekend, the Belleville Senators will pay tribute to the legendary Belleville McFarland’s team of 1959 that claimed the World Championships. The Senators will wear special replica McFarland’s jerseys for both games against the Toronto Marlies at CAA Arena while members of the team, including Red Berenson, Lional Botley, Pete Conacher, and others, will be in attendance. With the history of the McFarland’s on full display this weekend, we take a look back at that magical run that saw the team bring gold back to the Bay of Quinte. Down 3-1 in the 1958 Allan Cup final series, the Belleville McFarlands were staring right into the face of an imminent conclusion to their season. But they had some fight left just yet it seemed. After the McFarland’s took Game 1 of the series 4-0, the Kelowna Packers had rattled off three straight wins to take a commanding 3-1 series lead. A 4-2 win kept the McFarlands alive before a 4-3 victory sent the series to a decisive Game 7. An 8-5 win secured Belleville the 50th Allan Cup. And a berth in the 1959 World Championships. Held in Czechoslovakia from March 5-15 in 1959, Canada were seeking to win its 18th World Championship (the World Championships are the present-day IIHF World Championships that features a wealth of NHL players year in, year out). Canada, the defending champions, were drawn into Group A with Switzerland, Poland and hosts Czechoslovakia. Canada opened with a 9-0 victory over Poland before dismantling Switzerland 23-0 in the tournaments biggest victory. Canada completed a perfect group stage with a 7-2 win over Czechoslovakia. The hosts also got out of the group stage, and the two teams, along with the Soviet Union, USA, Sweden and Finland competed in the final round: a round-robin tournament to decide the tournament champion. 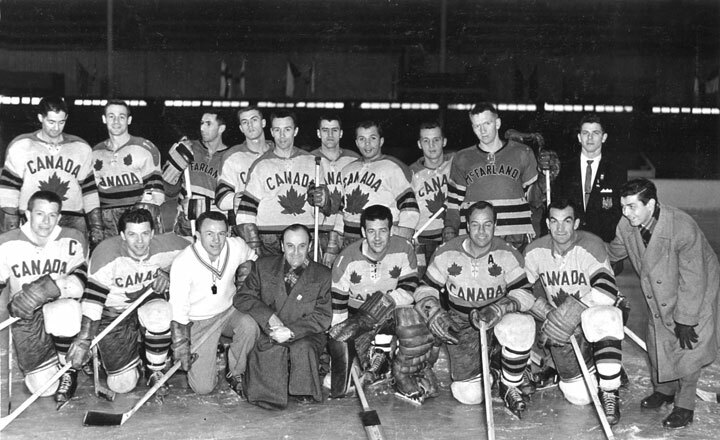 Canada opened with a 6-0 win over Finland before edging past the Soviet Union two days later by a 3-1 margin. Canada moved its record to 3-0 with a 5-0 win over Sweden before beating their North American rival USA 4-1. Heading into the final game of the tournament against Czechoslovakia, Canada had to avoid losing by more than seven goals (assuming the Soviet Union won and Canada lost) to claim the title. The Soviets beat Sweden 4-2 and despite Canada falling 5-3, they were crowned World Champions on goal difference, 14-10. Canada’s level of dominance in the tournament was incredible. The McFarlands conceded just nine goals in eight games and scored a tournament high 60 goals. Red Berenson, who would go on to play 987 games in the NHL and is one of seven players to score six goals in an NHL game, tallied a tournament tying high nine goals and added four assists in eight games. Player-head coach Ike Hildebrand not only coached his team to gold but added six goals and 12 points in the tournament. Defenceman Jean-Paul Lamirande was named the tournament’s best blue-liner. Between the sticks, Gordon Bell tallied a 1.50 GAA in six games while Marv Edwards didn’t concede a goal in two games. In one word, the Belleville McFarlands were ‘golden’. And they will be celebrated this weekend by the city of Belleville and Bay of Quinte, 60 years after their triumph on the world stage, at CAA Arena. Tickets for Friday and Saturday’s games against the Toronto Marlies are available by clicking here, at the Senators’ Box Office or by calling 1-855-985-5000.